Connie Goodwin leaves her post-graduate studies at Harvard University to assist in cleaning up and selling her Granna's house. She does this as a begrudging favor to her mother with whom she has had strained relationship due to their similarly opposing personalities. As the summer progresses Connie finds herself seeking not only a primary source for her PhD dissertation but the history of a woman that has captured her imagination. Along the way Connie begins to open her mind to things about herself and the history she studied all these years. Connie soon finds herself having visions of history that are too real to explain through logic. As her relationship with a steeplejack Sam progresses, her life soon begins to mirror that of the woman in the family tree she is researching. 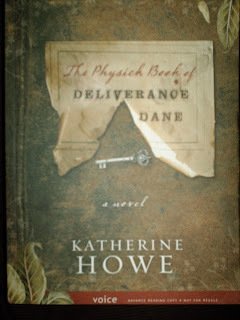 Katherine Howe has produced an intriguing character that complements the factual and fictional history within her book. Connie lives both in her today and other people's yesterdays. This dynamic is beautifully built into the character that develops. Howe has truly blended the plot with the character in this book. The use of various languages throughout the book takes the reader back to the time of Deliverance Dane and the Salem witch trials. The images invoked by Howe's descriptors is magnificent and allows the reader to be alongside the characters' journeys. This is sure to be on the must-read lists of tomorrow.